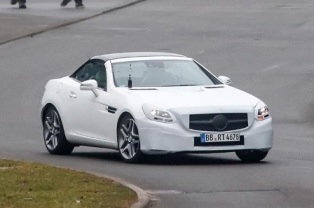 The 2016 Mercedes SLC has been spied undergoing testing in Europe. Essentially a facelifted and renamed SLK, the SLC features a familiar appearance but adopts a new front bumper, a revised grille and restyled headlights. We can also see restyled taillights which will likely be joined by a new rear bumper and a modified exhaust system. While the styling changes are relatively minor, the model could receive some new engines from the C-Class. The range-topping SLK 55 AMG could also be replace by a SLC 63 AMG that features a twin-turbo 4.0-liter V8 engine that develops 476 PS (350 kW) and 650 Nm (479 lb-ft) of torque.